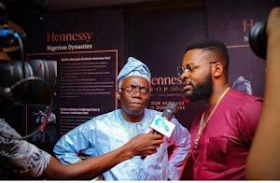 It can be recalled that during the week, a Muslim group gave Falz a seven-day ultimatum to eliminate his video "This is Nigeria" or face legal action. According to the group, the video made fun of their religion because in the video they saw some girls wearing hijab and dancing shaku shaku. In an interview with Entertainment Plus, human rights activist and prominent lawyer, Femi Falana (SAN), said he expects the Muslim group MURIC to appear in court at the expiration of the ultimatum given to his son. According to him, the video in question is loaded with messages and should be encouraged by anyone who has in his heart the interest of this country. In addition, Falana said he confirmed that his son, who is also a lawyer by profession, is handling the threat within the scope of the law. "My son is a lawyer and I have confirmed that he is handling the threat within the scope of the law, the video in question contains many messages and should be encouraged by anyone who has the interest of our country in mind." "Since the group threatened to sue him or threaten to sue him." My son promised that he would see them in court. I support that decision. We all belong to this country, nobody can threaten another person. Freedom of expression is constitutionally guaranteed, "said Falana. "If you feel injured as a result of a publication or registration, it is appropriate for you to go to court, and I hope you will go to court when the ultimatum given to my son expires," said the well-known lawyer.